Roger Ramius Sergei Alexander Chiang MacClintock has had a really bad year. Bad enough to be the spoiled rotten fop of a prince no one wanted or trusted. Worse to be sent off on a meaningless diplomatic mission, simply to get you out from underfoot, with a bodyguard of Marines who loathe and despise you. Worse yet to be assumed dead and marooned for almost a year on a hell-hole planet while you and those same Marines fight your way through carnivorous beasts, murderous natives, and perpetual rain to the only starport. . . which is controlled by the Empire's worst enemies. Worst of all to have discovered that you were born to be a warrior prince. One whose bodyguards have learned the same lesson. And one haunted by the deaths of almost a hundred of your Marines... for what you know now was an unnecessary exercise in political expediency. A warrior prince who wants to have a few choice words with your Lady Mother, the Empress of Man. But to have them, you, your surviving Marines, and your Mardukan allies must cross a demon-haunted ocean, face a civilization that is ''civilized'' in name alone and ''barbarians'' who may not be exactly what they seem, and once again battle against impossible odds. All so that you can attempt to somehow seize a heavily defended spaceport and hijack a starship to take you home. Yet what neither Roger, nor the Marines, nor his allies know is that the battle to leave Marduk is only the beginning. And that words with Roger's mother will be hard to come by. You don't mess with a MacClintock. 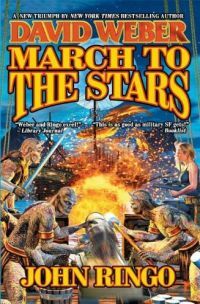 March to the Stars is the third book in the Empire of Man series by David Weber and John Ringo about Prince Roger and his space marines. In the book they finally after a year of traveling across the world are close to the space port. Nothing ever comes easy for them and this time they face sea monsters as they cross the ocean and religious zealots before finally needing to defeat a space port with inferior weaponry. Prince Roger continues to gain respect as both a leader and a warrior while also realizing that the goal of saving his mother, the empress, is coming closer to reality. His mixed feelings about his mother and the issue that his girlfriend is concerned that she is not worthy or desiring of royalty are mixed in as subplots. The book was decent but suffered from middle book syndrome in that the plot was too similar to the previous two books. You could easily skip this book and go right to book four, We Few, and not miss much. I give it three out of five stars as an enjoyable read with few surprises but still part of an excellent series overall.